Liftopia Plug: This is how we pay for this website — if you aren’t familiar with it, it’s a “clearinghouse” of sorts that many ski areas use to raise cash by selling discount tickets in advance, called Liftopia. If you haven’t used this service, it is important to knowfor certain that you are going on a specific date. The deeply discounted tickets must be purchased in advance; generally up to two days out. 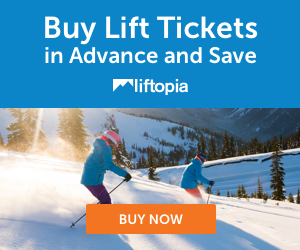 The sticking point is that some ski resorts only make a limited number of tickets available to Liftopia for any given day, so they might be sold out if you wait too long…so, as soon as you are absolutely, positively sure that you will be skiing on a certain day, click this link to get deeply discounted tickets. Like I said, these links support this website, no added cost to you. Save money, and support one of your favorite ski info sites at the same time.